Construction Management Strategies that are currently advocated for use in the construction industry are: value management, total quality management, constructability, benchmarking, partnering, reengineering, lean construction and supply chain management. Six Sigma is the hot new answer for improved business leadership and performance. 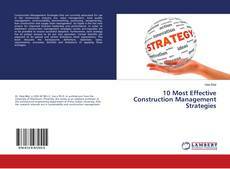 In order to implement construction management strategies certain pre-requisites are to be provided to ensure successful adoption. Furthermore, each strategy has its unique process to be put into operation. Certain benefits are expected to be gained and certain limitations check expectations. This book discusses the background, definitions, objectives, types, requirements, processes, benefits and limitations of applying these strategies. construction management, Management Strategies, partnering, benchmarking, Supply Chain Management, Six-Sigma, TQM, Re-engineering, Constructability, JIT.